Read through our Toddler Birthday Party Ideas - Rainbow Party and incorporate the best ideas into your party. Check out our cool Toddler Birthday Party Ideas for invitations. 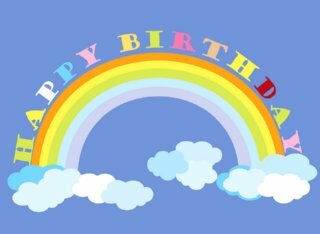 Draw a colour rainbow (with your computer), and print the party information beneath it with different colours. Add some white, blue, yellow, red glitter to the invitation for extra glamour! Also ask guests to come dressed in their favourite primary coloured clothes. Wording: "_____ Join us in the coolest Rainbow Bash! Our little Princess _____ is turning ONE! RSVP to____ by "date".This is your chance to wear your favourite rainbow colour, dress in all blue, red, yellow or another favourite colour!" The main colours for this Rainbow Party is the Rainbow colours - the rainbow colours in order: red, orange, yellow, green, blue, indigo, violet. Decorate the party area with colourful balloons and streamers, Hang rainbow streamers from the door frame for the guests to walk through. For extra touch put coloured cellophane paper on each window, the party room will be filled with different colours (if you do it right this can make the whole party room very beautiful). Get a colourful tablecloth and use colourful tableware, (in the rainbow colours). Put colourful streamers in rainbow colours across the tables, coming halfway down. Put colourful roses (different colour roses together), in a vase tightly bound with a green bow in the middle of the table for centrepiece. Or have a cupcake tree for centrepiece, (it's made in metal and you can get them at your craft store or party store). Put your colourful cupcakes (ice the cupcakes in different colours) on the tree, this looks amazing! Your princess will most probably not be interested in playing games with other kids, as babies are more interested in playing with their parents. But if you are going to invite older kids, here are some awesome Toddler Birthday Party Ideas for games and activities. Is a good game to introduce the children to each other at the start of the party. Let the children sit in a circle and sing "what is your.. what is your.. rainbow name" the person next to you has to answer "my name is.. my name is Anna" then you ask the group "what is.. what is.. her rainbow name" and then everyone answers "her rainbow name.. her rainbow name.. is Anna". Do this at least 2 times and everyone will know each others names. Similar to Musical Chairs, put colourful balloons next to each chair and play musical chairs. The winner gets all the balloons! Start by showing the kids how to play, try to explain a product, a fruit, something that has a colour. For example an "apple", you tell the kids it's a fruit, it's round, it grows on trees etc. The kids then have to guess it's a red apple. The person who guesses right has his/her turn to explain a colourful fruit, vegetable etc. and the other kids have to guess. Let the kids sit in a circle. Assign guests a colour, give them magazines and ask them to cut out anything of that colour and paste the pictures on to a sheet of paper. Give them crayons, markers, pastels, glitter and encourage them to be productive. Tell them they are artists and to produce a work of art in their colour. Similar to Treasure Hunt, let the kids look for rainbow related items. Buy pearls in different colours and let the girls of the party make their own rainbow necklace and bracelet. Provide them with blunt needles threaded with string. We have lots of yummy Toddler Birthday Party Ideas for food and drinks, pick the one you and your daughter like best. Rainbow Tortellini: Tortellini in different colours. Rainbow Salad: Make a colourful salad. Rainbow Mini Pizzas: Make mini pizzas in rainbow colour. Fried Chicken: Is a good dish to serve, both kids and adults will like this and goes perfect with the Rainbow Tortellini and the Rainbow Salad. Rainbow Fruit Salad with Rainbow Ice Cream: Make a colourful fruit salad and add ice cream served with ice balls in several colours. Rainbow Layered Jell-O: Make Jelly-O in different colours (cheap and easy). First make the first colour and put it in the refrigerator, let it cool and set completely, then add another colour of Jelly-O, put in the refrigerator and let it cool. Then re do the whole process until you have 3-5 different coloured Jelly-Os. Rainbow Milk: Serve colourful milk, chocolate milk, strawberry milk, banana milk etc. Rainbow Drinks: Add colourful ice with different forms, such as mini bears, mini harts, mini stars etc. Most party stores sell them and they can be re-used. The mini figures become ice when they are put in to the freezer. Rainbow Cupcakes: Buy or make yummy cupcakes and frost in rainbow colours or add a rainbow to them, you will find a little rainbow in most party stores. Our toddler birthday party ideas for cake is very easy to make! Make this cake by dividing the cake into three parts (cake batter), add different food colouring to each part. Bake in different separate pans. Frost between layers and make a Rainbow frosting on top of the cake. Fill your Goody Bags with: Coloured balloons, rainbow erasers, rainbow magnets, rainbow stickers, colourful crayons & markers. As for the actual bag, buy a bunch of colourful small lunch bags and hand paint a rainbow on each bag, have different coloured bags. I hope our Toddler Birthday Party Ideas will help you in your planning and I hope your princess will love and enjoy her Rainbow Party!